Fellow Wumpus enthusiast Warren Gaebel has cleverly recreated the original text version of Wumpus as a web page. You can enjoy his amazing accomplishment at the Original Wumpus page on his site. 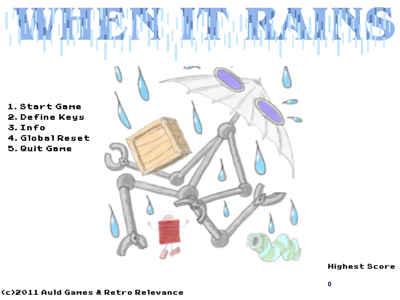 The brutal old-school platformer When It Rains is the brainchild of the mad Scotsmen behind Retro-Relevance and Auld Games. Yours truly took on the graphics and spriting duties, and it were a fun 'un. Give it a play today! Tonight (Mar 12 2012) I'm catching up on things that should have been posted long ago, plus a genuine new post. First up is Joe Gunn, an original C64 game that's an absolute corker. The work of many hands, with prolific gamesmith Georg Rottensteiner at the helm, it includes some scenery work by me. While it is freely downloadable for emulator play, it is also available commercially as a lovely cassette package, for the serious C64 lover in your life. Whichever course you take, I hope you'll give it a play. ToDR and Hunt The Wumpus both have patched releases. The ToDR update fixes the bug where the game would crash picking up the Warball&Chain in the hallway, as well as some less critical bugs. 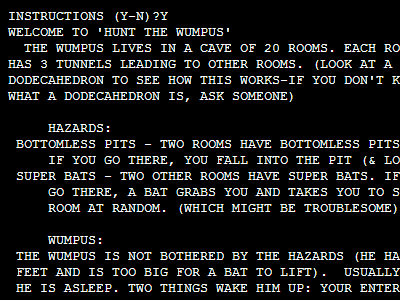 Hunt The Wumpus fixes an oversight where pressing the SHIFT key counted as a game move and could trigger bats. Both versions are available now, including a patch file for ToDR (if you already have the full version) and the updated Hunt The Wumpus online version. Thanks to everyone who sent in bug reports! Hank Mishkoff, composer of the original Tunnels of Doom music, has put up a page on that music, as well as the reworking by Frank 'Skyrunner' Scheffel. A very nice piece from one of the luminary talents of the TI's golden age, so please check it out. Two new fonts available for download. Well, technically old fonts, as they are hand-done recreations of the BASIC fonts from two classic computers - the TI-99/4A and the Commodore 64. Grab them from the Fonts page and take your texts back to the 1980s! A new update to ToDR is out, mostly to support the converted TOD adventures which are also now available. Download this pack of five classic TOD adventures (including Star Trek, Doctor Who, and the infamous K-Mart adventure) and play them in ToDR. Also available is the TOD Converter Tool for converting old TOD adventures on your own. You'll need the version 1.2 patch or full game (if you don't have ToDR at all) to play these. Have fun, and share with me any conversions of your own! 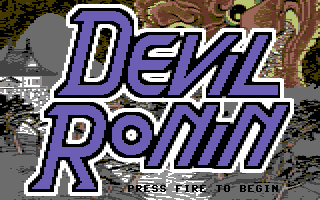 Here's the official release of my new game, Devil Ronin. 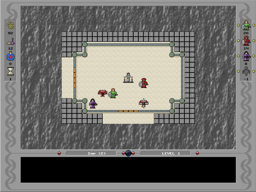 An entry in the 2008 Retro Remakes Competition, it's an old fashioned shooter/platformer set in historic Japan and done in Commodore 64 style. Hope you enjoy! A few bugs that managed to survive into the 1.0 release have been squashed and are addressed in the version 1.1 release. If you are downloading ToDR for the first time now then this is the version you will receive. If you downloaded ToDR before, then you'll want to grab the patch file and apply it to your installation. It is far smaller than downloading the whole game again, and easy to use. Email me if you experience any difficulties getting it installed. The long wait is over and Tunnels of Doom Reboot is finally released. It's been a long and challenging road, down which I've met some great people and learned some good lessons. Thank you to everyone who helped out and waited patiently while this was completed. I hope you enjoy the finished product and look forward to our future releases. Apologies once again for the lack of timeliness in keeping the site news current. I've been busy with moving house and other things lately. Anyway, the good news is that ToDR is out of beta and in 'golden' mode, meaning it's being prepped for release. I just have to finish up with a fullscreen bug and then update the manual, then ToDR will be out the door in finished form. Keep watching the site, it shouldn't be much longer now (knock wood). The ToDR beta testing kicked off on January 21, and we're into the second round of release-and-test right now. The testers found loads of bugs and had fantastic suggestions for improvements, and its been a very fruitful and efficient process. The second beta release is in their hands now, and I'm hoping to quash the last few bugs with this round and move on to a public release. A big round of thanks to all the testers! First off, let me say thanks to everyone who wrote in to volunteer as a beta tester. We've got a nice big group now, so I'm closing off any more signups. In other news, I'm preparing the game for the beta release itself this month. I'm still making some changes along the way. The most noticable updates are the addition of projectile effects and, finally, SOUNDS. The MP3 Java library seems to be working well, so I'm hopeful I'll be able to include a good number of sounds without making the game too much bigger. We'll see. Meanwhile, stay tuned for more news later this month. Hello again. ToDR is approaching a stable state and I am scheduling a beta release for January. This will only go out to the group of testers that have thus far signed up (contact me if interested). They'll go through it and find the bugs I missed, while I work on final touches and the Adventure Editor. After the beta is over it'll be out-the-door time for ToDR, so wish us luck and thanks for all your patience and support. Going good, going good, GOING GOOD! Tons of stuff done now that was hanging me up. We've got negotation with monsters, living statues, fountains to drink from, vaults to open, and hallway ambushes from wandering monsters! That's a lot of the major work done, now it's onto the remaining things like quests, some item management, and the remaining graphics and sounds. I hope you're all as excited as I am that there's finally some light ahead on this long, long road to the tunnels of doom. Check out the screenshot below for the vault opening mini-game, and be sure to visit the main ToDR page as I've updated all the screenshots there as well. 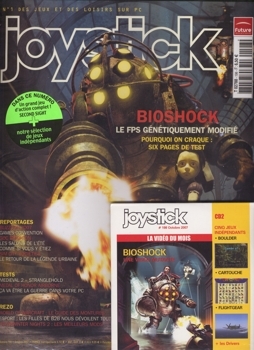 Cartouche is included on the cover CD of the October 2007 issue of the French gaming magazine Joystick. It shares the cover with several other good independent games, and the blockbuster PC title BioShock. Thanks to Future Publishing for selecting my game to share with their audience, I hope they enjoy it! Sorry for the lack of updates, but ToDR is most definitely still underway. I've made a lot of progress since the last report. The screenshot below (click for larger) shows many of the changes. Ranged combat for players is now in (you can see the targetting reticle in the screenshot), as is monster combat (shown by the fact that they've killed my rogue here). The colored gems beside the player icons show combat ranking (like the pluses and minuses in the original), so that you have an idea how your party stacks up against the current foe. Also I finished adding the escape code, whereby your party can flee the room. This bit of code led to more changes, including the ability to have adjacent rooms in a dungeon (something missing from the original). More news as it develops, and thanks for your continued interest and patience. A new game, this time in the mold of the popular Match-3 games. Cartouche puts you in an Egyptian setting, matching hieroglyps. But unlike other Match-3 games, there are two ways to win - match on color and match on symbol. Download Cartouche today and see what a difference this new technique makes. Chirality is upgraded again, with better handling and a default fullscreen mode. Also available is Chirality+, with extra visual effects and corresponding CPU load. Play it if you've got a powerful system and like eye candy. Now that my plate is clear of other games it's full steam ahead on finishing ToDR. Coding and graphics are both getting a lot of attention, and the musician is turning in more great soundtrack pieces. More news as it develops. In the meantime, here the player sprites for the game. 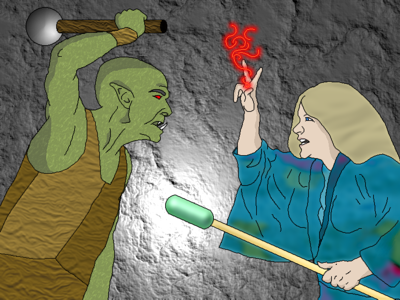 Your party can contain Fighters, Wizards, Rogues or a solo Hero from any of six ancient empires - Celtic, Persian, Finnish, Japanese, Amazon, and Hittite. A new release of Chirality is available. It has more options, added voice effects, and better endgame transitions. I hope you enjoy! Another new game that comes from an old idea of mine. The basis for Chirality came to me back in the Amiga days, but recently returned and crystallised into the form on offer here. It's one of a series of 'art as game' ideas I've been wanting to develop. I hope you find the simple play both challenging and hypnotic. Just in time for the 25th anniversary of the TI-99/4A classic Munchman, here's the release of MunchMates. This game recreates the original Munchman game with new graphics and music, plus gives you a new board, and a chance to play the unreleased original prototype board for Munchman. Head on over to the MunchMates page and download it for maze-munching fun. rE/Generation gets a major upgrade with the final inclusion of a SAVE capability. Now you can save your current progress as you struggle to liberate the sea platform from the Neogens. Make sure you read the new notes file included in the release for more information.